Nancy Calcutt, a native Northeastener born in Massachusetts in the 1950's, grew up in Sturbridge, Massachusetts. While in her 20's, she moved to the southern states (USA) first to coastal North Carolina and then to Nashville, Tennessee. Calcutt and her musician husband now live in Paducah, Kentucky, where they have resided since 2003. They moved to Paducah to become part of Paducah's Artist Relocation Program. an urban revitilization program using the arts to enhance economic development. Calcutt inherited artistic genes from her dad who always wanted to be an artist but was too practical a person to follow that dream. She is following her father's dream and it has taken her on quite a journey. Always the restless seeker, Calcutt is the gypsy of her large family. She has lived in Massachusetts, North Carolina, Tennessee, Mississippi and currently Kentucky. Her first introduction to professional artists was during childhood, around her pre-teen years, when her family visited Provincetown, Massachusetts, an artists' community at the tip of the Cape Cod peninsula in Massachusetts. In Provincetown, Calcutt became captivated by the artists drawing pastel portraits from live sitters outdoors. These artists and their portraits seemed magical to her and she never forgot that moment, later teaching herself to create pastel portraits. Additionally, Provincetown made an impression on her because it was an active, successful art community, extremely bohemian, fun and full of possibilities for artistic production. An academically trained artist, Calcutt earned a Bachelor of Fine Arts degree in painting from Austin Peay State University in Clarksville, Tennessee and a Master of Fine Arts in painting from the University of Mississippi, in Oxford, Mississippi. For many years, Calcutt taught drawing and painting at the college level. In 2001, Calcutt left her full time teaching position, in order to more fully devote her time to her art. Calcutt's artistic inspiration emerges from her life experiences and interests: a deep love of nature and animals, especially dogs and horses, and a passion for music and dance. Besides visual art, she sings, plays mandolin and various rhythm instruments, like tambourine; she also loves to dance and watch dancers perform. Calcutt's musical background includes playing and singing professionally with her singer/songwriter husband. These are the subjects that populate her colorful and lively mixed media paintings. Calcutt's work has been featured in solo and group exhibitions earning numerous awards and honors. Her awards and honors include two Best of Show awards, and Artist Development Grant, a Purchase Award from the Pastel Society of America and a work in the permanent collection of Binney & Smith Corporation. Additionally, her work has been included in the prestigious Larson Biennial National Drawing Competition. 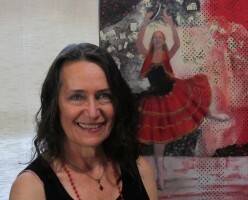 One of Calcutt's most distinct honors was to have her art travel to Australia wih the "Works on Paper Exchange Exhibit" at the Victoria College of the Arts in Melbourne, Australia. My current body of work, mixed media paintings on panel, combine three of my favorite media: drawing, painting and collage. Each painting is created with layers of acrylic and/or oil paint, charcoal, graphite or ink and handmade and decorative paper. The fininished artwork merges the styles of realism and abstraction. When I begin a new piece, I do not have a finished composition in mind. My first step is to create an inviting surface that stimulates my imagination. This is done by toning a painting panel with acrylic paint or by collaging some decorative or handmade paper onto the panel. Then I brush on large areas of acrylic paint and sometimes roll the paint on with printmaking brayers. Next, I may add some stamped marks, using my rubber stamp collection. I make several of these abstract panels a set them aside for future use. To start a new painting, I decide on a figure or figures that fascinate me, choose one of my prepared panels, and sketch the figures onto the panel with charcoal or ink. Once the figures are sketched in, I cut, tear and paste some paper to the piece and away I go. Each piece of artwork goes through a multi-phased metamorphosis which is constantly evolving and, once it reaches the point where I am happy with it, the work is done. However, if I am not satisfied with the end result, I'll paint or collage over it and the piece continues to transform. My process is like a free form, improvisational dance where the dancers make up the moves as they dance. When I go into my studio, I try to let go, trust my instincts and have fun. My aim is to surprise myself and ultimately surprise the viewer, to make work that is quirky, expressive and aesthetically pleasing. What is my work about? Beauty, color, energy, and life force inspire me and because people, animals and nature abound in these qualities, they are my primary subjects. My artwork is not dark, in fact it is the opposite of darkness. What am I communicating? Freedom, love, sensuality, all of the things from the 1960's... peace, love, flower power, the visions of an aging hippie! A lot of my paintings are my happy dance and a reclamation of the child within, a psychological concept denoting a person's original or true self. I believe in the power of art to uplift, enrich and transform our lives and the importance of beauty in our lives. There is a Navaho prayer that speaks of "walking in beauty" all of our days. This Native American concept of the Beauty Way is a piece of ancient wisdom sorely needed in our contemporary world. Many art critics and some artists think the pursuit of beauty in art is terribly old fashioned. Artists don't want to be viewed as old fashioned, nostalgic or insignificant. They don't want to be dismissed, so they will often squelch their natural pursuit of beauty. I don't agree with these artists or critics. Isn't there already enough ugliness in the world? My purpose is to create beautiful works of art that will last my lifetime and beyond and to share my vision of beauty with my viewers.